Just when I thought it was safe to take a holiday, our paper presenting new detailed calculations of the radiative forcing for carbon dioxide, nitrous oxide and methane was published in Geophysical Research Letters on 27th December. For me, this paper was a blast from the past, as one of the first papers I wrote as a postdoc in 1998 was on a similar topic, and shares 3 out of 4 authors, myself, Keith Shine and Gunnar Myhre. 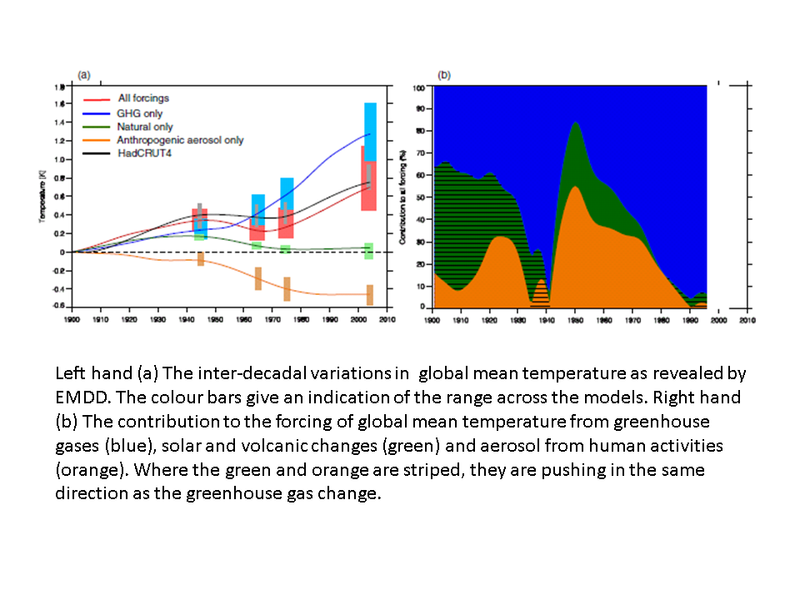 The recent paper, co-authored with PhD student Maryam Etminan, describes new research on methane’s climate impact that has been performed at the Department of Meteorology at the University of Reading, UK and the Center for International Climate and Environmental Research – Oslo (CICERO) in Norway; it indicates that the climate effect of changes in methane concentrations due to human activity has been significantly underestimated. It also uses these detailed calculations to revise the simplified expressions for estimating radiative forcing adopted by the Intergovernmental Panel on Climate Change (IPCC). The new calculations indicate that the direct effect of increases in the concentration of methane on climate is 25% higher than represented by the expressions previously adopted by the IPCC, making its present-day radiative forcing (relative to pre-industrial values) about one-third as powerful as carbon dioxide. The paper has attracted some attention on social media as the calculations may have an impact on policy decisions in the future. Therefore I take the opportunity here, with much of the text below written by my co-author Keith Shine, to both summarise the study and answer some of the questions that have arisen so far. Does this mean that our previous estimates of radiative forcing due to carbon dioxide have been over-estimated? No. Carbon dioxide remains the most significant greenhouse gas driving human induced climate change. In fact in this study we also looked at the estimates of forcing due to carbon dioxide using the same physical understanding as used for methane, and found forcing very similar to previous estimates, except for some underestimation at very high carbon dioxide concentrations. So if the forcing due to methane has been underestimated in the past, why hasn’t the global mean temperature increased more? The climate impact (e.g. temperature change) resulting from a radiative forcing change in the atmosphere depends on both the radiative forcing and how the climate system responds to that forcing. 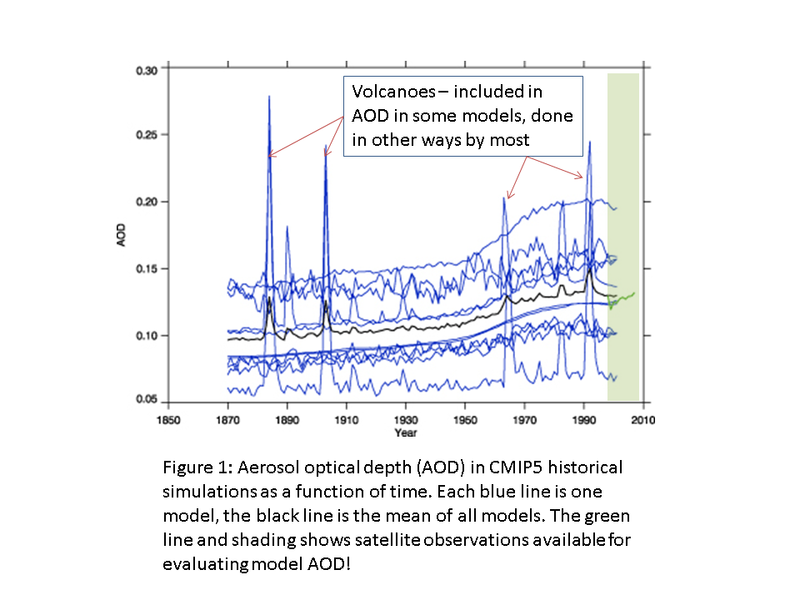 Although we have shown that the carbon dioxide forcings are little different to our earlier calculations, there are other changes that cause a radiative forcing that have documented very large uncertainties, for example aerosols (and in particular their impact on clouds) that could easily counteract the additional forcing from methane. 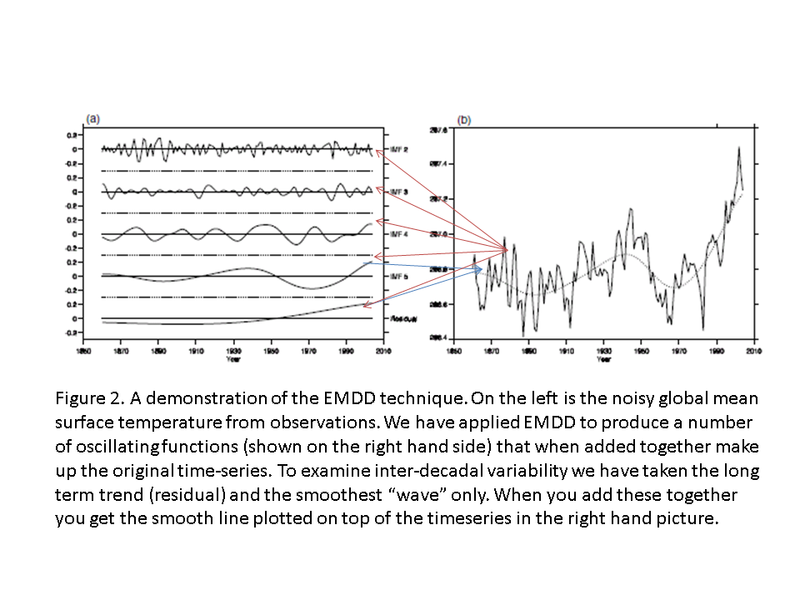 Even if we knew the forcing accurately, the uncertainty in the climate response is also large enough that it isn’t a problem to reconcile the observed temperature changes. We are in fact refining the uncertainties through this type of study. So why the focus on methane? Human activity has led to more than a doubling of the atmospheric concentration of methane since the 18th century. Methane is a powerful greenhouse gas. It is the second most important greenhouse gas driving human-induced climate change, after carbon dioxide. Its warming effect had been calculated to be about one-quarter of that due to carbon dioxide. Methane emissions due to human activity come from agricultural sources, such as livestock, soil management and rice production, and from the production and use of coal, oil and natural gas. What did you do that was different? Previous calculations had focused attention on the role of methane in the “greenhouse” trapping of infrared energy emitted by the Earth and its atmosphere, primarily at wavelengths of around 7.5 microns. The vital element in the new research is that detailed account is taken of the way methane absorbs infrared energy emitted by the Sun, at wavelengths between 1 and 4 microns. The effect of this additional absorption of Sun’s infrared radiation is complicated, as it depends on the altitudes at which the additional energy is absorbed. This determines whether the extra absorption enhances or opposes the greenhouse trapping. It has been known for many years that the absorption of the Sun’s energy by carbon dioxide reduces its climate effect by about 4%, because much of the additional absorption happens high in the atmosphere. The new calculations of the effect of methane indicate that much of the extra absorption is in the lower part of the atmosphere, where it has a warming effect. The research shows that clouds play a particularly important role in causing this enhanced warming effect. Clouds scatter some of the sun’s rays back into space; it is the additional absorption of these scattered rays by methane that drives the warming effect, a factor that had not been included in earlier studies. Are these results important for climate change negotiations? The new calculations are important for not only quantifying methane’s contribution to human-induced climate change, but also for the operation of the Kyoto Protocol to the United Nations Framework Convention on Climate Change (UNFCCC). This takes into account emissions of many greenhouse gases in addition to carbon dioxide. The emissions of these other greenhouse gases are given a “carbon-dioxide equivalence” by multiplying them by a quantity called the “100-year Global Warming Potential” GWP(100); a similar approach is likely to be adopted by most countries for the operation of the UNFCCC’s more recent Paris Agreement. The GWP(100) for methane includes not only its direct impact on the Earth’s energy budget, but methane’s indirect role, via chemical reactions, on the abundance of other atmospheric gases, such as ozone. Applying the results of the new calculations to the value of the GWP(100) presented in the Intergovernmental Panel on Climate Change’s (IPCC) most recent (2013) assessment, enhances it by about 15%. This means that a 1-tonne emission of methane would be valued the same as 32 tonnes of carbon dioxide emissions, up from the IPCC’s most recent value of 28. Hence for countries with large emissions of methane due to human activity, it would lead to a significant re-valuing of their climate effect, relative to emissions of carbon dioxide. Can you be more specific about that? In fact the GWP values have changed substantially due to new research since the Kyoto Protocol, and these changes are reported in the IPCC reports. CO2 remains the dominant greenhouse gas emission from both developed (so-called Annex1) countries (77%) and non-Annex1 (65%) countries but using our revised value in place of the IPCC AR5 value, methane emissions now exceed 40% of CO2 emissions in developing countries, in CO2 equivalent terms, up from 36%. In developed countries, they are now almost one-quarter of the CO2 emissions (23% up from 20%). So when might these new values influence policy? The research team identified a number of uncertainties in the calculation of this enhanced absorption by methane, which will require further research to reduce. The new results are unlikely to be recommended for adoption in international treaties until they have been fully considered by the assessment process of the Intergovernmental Panel on Climate Change. The new research was partly funded by the Research Council of Norway, and the UK’s Natural Environment Research Council. In honour of National Poetry Day and inspired by the Royal Society meeting on “Next Steps in Climate” here is my rather un-sophisticated summary of the meeting in poem form. I accept the challenge. Do you?